An experimental investigation of thermal and electrical effects of hotspots has been carried out for four different field aged solar photovoltaic modules. The primary objective of the paper is to non-destructive performance monitoring of test modules under various shading configurations to evaluate the impact of the partial shading on the thermal stress of the solar modules. The influence of the solar module technology, number of cell per bypass diode, the position of the partial shading has also been studied. Further, the possibility of destructive hotspots has been forecasted. The function of bypass diode has also been considered under different shading conditions. Based on the temperature profile extracted from the infrared thermography images, it has been observed that the sun power and the HIT modules perform better and reliable as compared to the conventional Mono and Multi-crystalline solar modules in the unfavorable condition. This study and analysis may be useful for manufacturers of the solar cell and module and solar field installer to set up a proper plant with safety standards along with long-term dependability and strength. The solar energy sector has experienced remarkable growth in recent years due to technical developments, encouraging government policies and cost reduction.1 However, the large-scale market-driven growth of solar photovoltaic technologies has to overcome technical hurdles such as performance and reliability.2 The solar photovoltaic modules (SPV) are expected to perform with an acceptable degradation rate during their lifetime, i.e., 25 years.3 The performance of SPV module depends on the material properties (i.e., band gap, electron-hole concentration, lattice structure, etc. ), electrical behavior (i.e., series resistance (Rs), shunt resistance (Rsh), short circuit current, open circuit voltage, etc.). Environmental parameters (i.e., solar radiation, ambient temperature, humidity, air pollution and dust particles) also plays a significant role in the operation.4 The effect of these parameters can be optimized by utilizing optimal design and assembling strategies of solar cells and modules, to obtain maximum output and reliable performance in outdoor operating conditions.5 The long-term monitoring and assessment of solar power production over time provide the reliability and durability of SPV modules at particular climatic zones.6 The process of monitoring the condition of the solar modules at the field is considered as the performance monitoring. It aims to check the current status of the plant, to deduct the early degradation, prevent the unexpected breakdown, maximize the plant life, and reduce failure percentage in the field. Apart from the financial and economic losses it also leads to accidental damage to the society and the environment. The efficient performance monitoring aim is to monitor the solar module components, system designs, and faults, thereby enhancing the quality of the manufactured product and reduction in the maintenance cost. Various imaging techniques such as electroluminescence (EL), photoluminescence (PL), and infrared (IR) technologies are being used to detect the hotspot phenomenon in the SPV modules,11,12 etc. Table 1 describes much literature in which the Infrared thermography used for experimental performance monitoring.13–20 The Infrared thermography (IR Imaging) is a non-destructive and useful tool for the subject area of the temperature distribution of photovoltaic cell, modules surfaces and even for rapid testing of other components of SPV systems. Any objects with the temperature 0K (i.e., 273°C) emits electromagnetic radiation in the Infrared region (wavelength range of 0.75-1000μm) of the electromagnetic spectrum. In Infrared thermography, radiation emitted by an object is detected in a non-contact way by an infrared detector and using the Stefan-Boltzmann’s law. Using the equation 1, the temperature of the body is obtained. ϵ= Emissivity of the emitting surface for a fixed wavelength and absolute temperature. Infrared thermography based performance monitoring offers several advantages as it requires minimum number of the instrumentation (Basis requirement is the Infrared camera and the camera stand), it provides instantaneous data from the field and permits in situ analysis and control of processes along with the storage facilities, it is a non-destructive technique that measures temperature and emissivity without direct contact with the field systems. 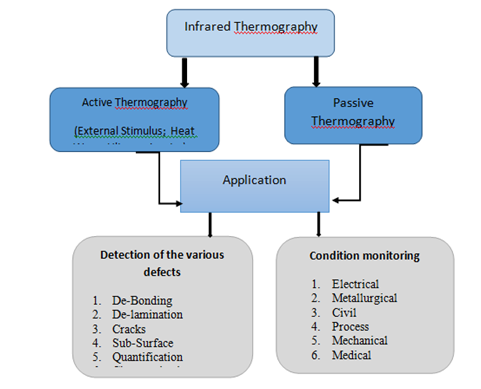 Figure 1 represents the Passive and active thermography techniques along with their applications. Sinha et al.12 has developed an electro-thermal model to simulate the active thermography approach for the characterization of de-lamination in SPV module using a circuit simulator by equivalent resistance-capacitance (RC) network. This method has a potential of quality check for the SPV modules during production as well as during outdoor operation. 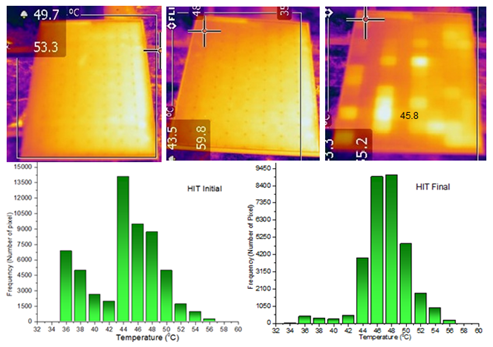 Simon et al.21 studied the mapping of the surface temperature distribution of solar cells operating in the reverse bias mode using the infrared thermography and found out that some cells exhibited an inhomogeneity of the surface temperature resulting in localized heating (hotspot) and revealed that hotspot heating causes irreversible destruction of the solar cell structure. Figure 1 Graphic representation of the passive and active thermography techniques along with their applications. Passive thermography Approach Studies the degradation eﬀects over field aged (18–22 years) SPV modules. The Detector is an uncooled micro-bolometer with spectral range 7.5 to 14µm. Passive thermography Approach Drone-based aerial thermography of defective modules and cells in large photovoltaic Power plants. Active thermography approach- An electro-thermal model was developed for characterization of delamination in SPV module. Active thermography approach - Quantitative values for local reverse current and series resistance images in hot-spots can be easily obtained in 10 ms and 800 ms respectively. IR thermography to show the infrared luminance of the PV Panel surface. Passive thermography Approach Processing and Interpretation of the thermo-graphical images acquired on a grid-connected photovoltaic plant (20 kwp). Temperature between -20°C and +55°C. Passive thermography Approach Detailed characterization of PV modules. The thermal and electrical effects caused by outdoor hot-spot testing in crystalline silicon modules. Passive thermography Approach Analyze a sample of 200 defective PV modules from two PV plants. Passive thermographyApproach Quality control of different thin film module technologies (a-Si, CdTe, and CIS) was investigated using IR thermography. The Wavelength sensitivity of the IR-detectoris 7.5휇m and15휇m. In the present study, infrared images have been used for mapping the temperature distribution under several partial shading conditions to determine the correlation between thermal imaging and electrical properties of the solar photovoltaic modules in the composite climate of India. Periodic Infrared thermography may be useful for the early identification and potential removal of the hotspot solar modules from the SPV power plants to mitigate future module mismatch issues at the string levels. The SPV modules of the four different technologies i.e. mono-crystalline, multi-crystalline, Silicon heterojunction technology (HIT) and Interdigitated back contact cell technology (SunPower)have been installed at National Institute of Solar energy (NISE), Gurugram, India (Latitude 28.37N, Longitude 77.04E) at an altitude of 215m (above mean sea level) having composite Climate. The field aged SPV modules have been investigated using Forward Looking Infrared (FLIR) Camera and measurement of electrical parameters such as voltage and currentas shown by the graphical representation of the experimental setup in Figure 2. The four solar module technologies are deployed in the outdoor field since 2014 working in a loaded condition. The I-V tracer and weather and weather monitoring station have been used for the measurement of current-voltage characteristics and environmental parameters respectively. The technical specifications of SPV modules are presented in Table 2 and specifications of the FLIR camera is shown in Table 3. The details of the I-V analyzer are provided in Table 4. Figure 2 Experimental setup for performance monitoring of SPV system using Infrared thermography. Where Tnormalized is translated (normalized) temperature. Tambient is an ambient temperature measured at the site. The IR images and electrical measurements have been analyzed under several configurations, to assess the performance of SPV module after three years of outdoor operations, about identification the hotspot defect. 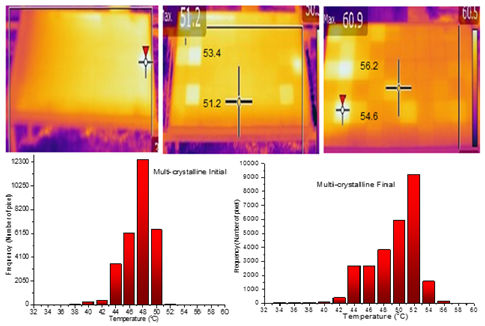 Subsequently, the use of the thermography techniques is emphasized and elucidated for the detection and characterization of the SPV modules degradation. The results comprise of the thermal impact of the surrounding temperature over the PV modules in outdoor condition, Hotspot formation, Impact of various shading configuration in the loaded state, analysis of the electrical behavior of the field aged solar module technologies. 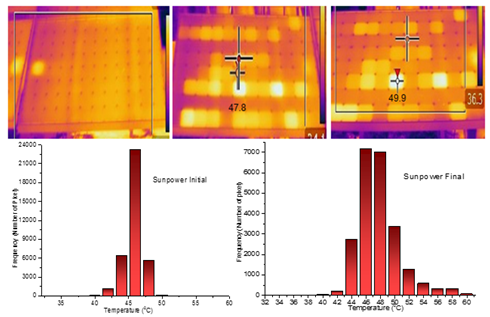 The temperature mapping and histogram representation of measured temperature at the initial (i.e., first measurement after 10 minutes) and final condition (measurement after 2 hours) of field aged sun power, Multi-crystalline, HIT and Mono-crystalline SPV modules are shown in Figure 3‒6 respectively. The triplets of the Infrared images of SPV modules have been presented for each technology along with the thermal mapping in the form of the histogram extracted from the thermographic images for the 2-hour duration (i.e., initial, medium and final condition). The initial images provide a starting temperature distribution and the last image give the gain in the temperature after 2 hours. The high-temperature cells, i.e., hotspots are shown as brighter in the images. It has been observed that the temperature of modules and number of hotspots increases with time, while the rate and range of temperature increment depend on the SPV module technology. The severity of the hotspot formation will depend on the amount of power dissipated due to a high reverse bias voltage which causes the gain in the temperature of the cell region. The mode value of the histogram is taken as the representative temperature for the field aged PV module since it is the most frequently occurring temperature in the module IR image. In case of sun power module, the maximum frequency for temperature is found to be shifted from 45.5°C to 46.6°C with an increment of 2.19% over a time period of 2 hours, while the range of temperature within a module varies from 40°C-50.02°C to 40°C-60°C. Multi-crystalline module has the highest increment of 8.33% over a time period of 2 hours occurs while the maximum frequency for temperature is found to be shifted from 48°C to 52°C with the range of temperature within a module varies initial from 40°C-52°C to 41.5°C-56°C. In case of HIT module, an increment of 4.54% over a term of 2 hours occurs while the maximum frequency for temperature is found to be shifted from 44 °C to 46.6 °C with the range of temperature within a module varies from 35°C-57°C to 36°C-56°C. Although the HIT technology is low-temperature coefficient and impacts over increment in temperature is small in power loss. 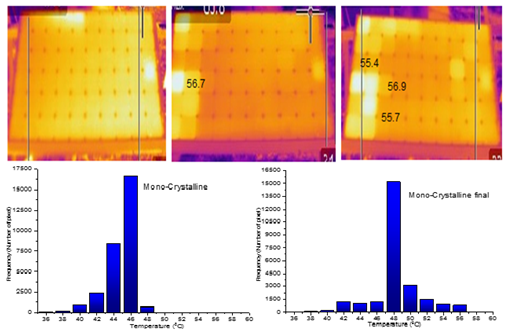 The increase in the temperature of Mono-crystalline is from 46°C-48°C, the gain in the percentage is about 4.34% whereas the range of temperature within a module varies from 38°C- 48°C to 38°C-57°C. Figure 3 The series of the sun power module in short circuit condition to detect the hot solar celland Temperature histogram extracted from the IR images of the sun power module. Figure 4 The series of the Multi-crystalline module in short circuit condition to detect the hot solar celland Temperature histogram extracted from the IR images. Figure 5 The series of the HIT module in short circuit condition to detect the hot solar celland Temperature histogram extracted from the IR images. Figure 6 The series of the Mono-crystalline module in short circuit condition to detect the hot solar celland Temperature histogram extracted from the IR images. It has also been observed that the temperature of hotspot also depends on the positioning of cell and bypass diode in the string due to heat dissipation. This temperature increase of a cell near to the junction box causes a variation in voltage (∆V), which results in the mismatch between the solar cells equivalent to partial shadowing effect and leads to the reduction of power output (∆P). If this effect is long and steady, the cell operating under increased temperature will eventually experience a slow physical degradation, leading to permanently reduced the power output of the solar modules. Several hotspots and the temperature raised have been notices which may be related to the faults in the fabrics or the soldering. It may also be due to several defects occurs at the stage of the manufacturing. In general, the thermal stress impact occurs in modules mainly anywhere within solar cell surface may be found due to their origin in the manufacturing material. Crystal dislocations or impurities around crystal domains or along a side of ingot often produce a wide construction area in solar cells. Sometimes thermal stress also occurs at the edges, sides or corner of the cell usually due to shaping. A crack may be created due to the mechanical pressure or sawing. This micro-crack could be inspected from IR thermography if severe in condition. This reverse bias heating phenomenon is not always harmful to the module performance but is extensively used with the IR imaging technique as a field diagnostic method. To investigate the impact of partial shading, the maximum temperature increment for various shading profiles over different solar module technologies have been analyzed and compared with electrical characterization. I-V curve was obtained for nine shading configurations using an opaque board by triggering each diode one by one for all the solar modules technologies. The mono and multi-crystalline modules have 20 cells in each string, and the three strings are connected in series. In sun power module, each string has 32 cells, and three strings are connected in series, while in HIT module, the four strings are connected in series, and each string has 26 cells. The modules have one diode for each string, i.e., 3 diodes for sun power, monocrystalline and multicrystalline modules while four diodes for HIT module, connected in a way, that each diode would bypass the respective string only. The I-V curves obtained under the various conﬁgurations, i.e., activation of bypass diode, and IR image for all diodes activated for the HIT, mono, and multi-crystalline SPV modules have been presented. Figure 7 shows the I-V characteristics curve which describes the triggering of all the four diodes in the HIT solar module by various shading patterns and Infrared image of the worst condition has been shown. The temperature has been rise from the 44°C up to 63°C maximum in worst shading configuration of the module. From the Figure 8, the Multi-crystalline solar module has an increment of the 48°C to the 59.3°C. In Figure 9, the Monocrystalline solar module has been raised in the temperature from 46°C to 60°C. The temperature increment above the junction box is the hottest cell compare to the rest of the module in all the cases. In general, the maximum temperature is obtained when a significant dimension of the modules was shaded. It is imperative to note that the increase in temperature depends on factors that the modules which are in shaded behave as a power dissipation device (like a resistor) which is called reverse bias, starts consuming power and hence produced heat. This increment in the temperature affects the voltage series resistance of the modules. If these states occur for a more extended period, it may cause the hotspot or the permanent degradation of the modules material. Figure 7 I-V Characteristics curve of HIT module in all shading configuration and IR image in the worst case (all three diodes activated). Figure 8I-V Characteristics curve of Mono-crystalline module in all shading configuration and IR image in the worst case (all three diodes activated). Figure 9 I-V Characteristics curve of Multi-crystalline module in all shading configuration and IR image in the worst case (all three diodes activated). The number of cells serially connected does not affect the point at which the bypass diodes, but it is crucial to maximum temperature reached by the shaded cell. The various shading configurations help to correlate all the possible combination of the shading and triggering the bypass diodes. The I-V characteristics curve of the solar modules shows that the deterioration in SPV performance is mainly due to high resistance to various shading conditions. The parasitic series resistance for different SPV module technologies is given in Table 5. It has been observed that the partial shading of a string is more hazardous than full shading, as the series resistance of a module with 50% shaded string is higher than that of the 100% shaded strings. Electrical degradation can cause severe failures at all level of the PV system, PV cell, modules and array. Some common field aged electrical deterioration is the micro cracks, snail trails, delamination, Back sheet tearing or cracking, faulty solder joints, etc. These types of defects cause an increase in the series resistance which leads to the generation of the more thermal stress cause non-uniform temperature profiling which can be easily detected through the IR methods. During the partial shading effect, the series resistance for each profile is also measured. The series resistance of all the four technology shows increasing behavior with an appositive value of the slope. From the I-V curve of all the modules, the decreased slope at Open circuit voltage proves the existence of a high series resistance due to the shading. The series resistance of the SPV modules is increased by increasing the shading fraction over the modules. This will impact on the modules if modules remain in same states. Periodic Infrared thermography may be useful for the early identification and potential removal of the hotspot solar modules from the SPV power plants to mitigate future module mismatch issues at the string levels. Improvements to the IR modelling approaches could be made by considering the different source of IR losses in the image and further the image processing. For monitoring the large solar power plants through the IR images could be an important tool to save time and labor. 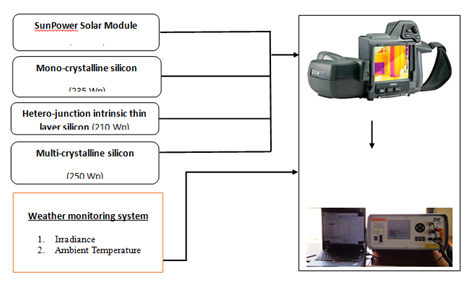 In this paper, an overview has been provided on the uses of different approaches of Infrared thermography for monitoring, detection, and characterization of different field aged solar modules. A comprehensive evaluation of the thermal and electrical effects caused by the partial shading has been carried out for four different SPV module technologies. The increment in maximum frequency temperature of an SPV module is observed to be highest in Multi-crystalline technology. The increase in the range of module temperature is an indication of non-uniformity of the temperature of each cell within the module, which, in turn, is either prone to or occurrence of the hotspot. The range of temperature is found to be increased significantly in the sun power and Mono-crystalline modules as compared to others, and therefore, the hotspots are apparently visible in the IR images. The relative temperature differences measured within the solar cell may assist in the diagnosis of early degradation in the solar module. The partial shading of string or cell within an SPV module is more severe than that of full shading and causes more degradation. Khan J, Arsalan MH. Solar power technologies for sustainable electricity generation - A review. Renewable and Sustainable Energy Reviews. 2016;55:414–425. Yadav K, Sastry OS, Wandhare R, et al. Performance comparison of controllers for solar PV water pumping applications. Solar Energy. 2015;119:195–202. Sahoo SK. Renewable and sustainable energy reviews solar photovoltaic energy progress in India: A review. Renewable and Sustainable Energy Reviews. 2016;59:927–939. Bora B, Sastry OS, Singh R, et al. Series resistance measurement of solar pv modules using mesh in real outdoor condition. EnergyProcedia. 2016;90:503–508. Rawat R, Singh R, Sastry OS, et al. Performance evaluation of micromorph based thin film photovoltaic modules in real operating conditions of composite climate. Energy. 2017;120:537–548. Dash PK, Gupta NC, Rawat R, et al. A novel climate classification criterion based on the performance of solar photovoltaic technologies. Solar Energy. 2017;144:392–398. García M, Marroyo L, Lorenzo E, et al. Observed degradation in photovoltaic plants affected by hot-spots. Progress in Photovoltaics: Research and Applications. 2014;22:1292–1301. Timothy P, Silverman J, Deceglie MG. Partial shade stress test for thin-film photovoltaic modules. SPIE. 2015:18302. Dubey R, Chattopadhyay S, Kuthanazhi V, et al. Comprehensive study of performance degradation of field-mounted photovoltaic modules in India. Energy Science & Engineering. 2017;5:51–64. Sinha A, Sastry OS, Gupta R. Detection and characterisation of delamination in PV modules by active infrared thermography. Nondestructive Testing & Evaluation. 2016;31:1–16. Kaseman M, Kwapil W, Walter B, et al. Progress in Silicon Solar Cell Characterization With Infrared Imaging Methods. 23rd European Photovoltaic Solar Energy Conference. 2008 Sep 1-5; Valencia, Spain. Tsanakas JA, Botsaris PN. Non-destructive in situ evaluation of a PV module performance using infrared thermography.2009. Nofuentes G, Chenlo F. Renewable Energy in the Service of Mankind Vol II. Germany: Spinger; 2016;477–481. Alonso-García MC, Herrmann W, Böhmer W, et al. Thermal and electrical effects caused by outdoor hot-spot testing in associations of photovoltaic cells. Prog. Progress in Photovoltaics: Research and Applications. 2003;11(5):293–307. Moretón R, Lorenzo E, Narvarte L. Experimental observations on hot-spots and derived acceptance/rejection criteria. Solar Energy. 2015;118:28–40. Ebner R, Kubicek B, Ujvari G, et al. Optical characterization of different thin film module technologies. International Journal of Photoenergy. 2015. 12 p.
Simon M, Meyer EL. Detection and analysis of hot-spot formation in solar cells. Solar EnergyMaterialsandSolar Cells. 2010;94(2):106–113. ©2018 Singh et al. This is an open access article distributed under the terms of the Creative Commons Attribution License , which permits unrestricted use, distribution, and build upon your work non-commercially.